Robert Gracey isn’t just an acupuncturist and holistic healer; he knows first-hand about the transformative power of acupuncture because he experienced it himself. 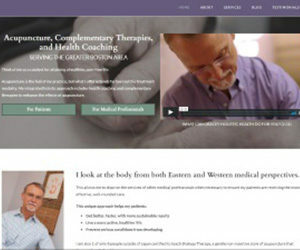 His own personal journey to optimum health is one that many of his clients may relate to. Because of this, he treats each client as a person — not a patient — in a peaceful clinical setting. Gracey’s interest in eastern healing medicine was sparked when he began practicing meditation after college. He earned certification in Reiki, a Japanese form of healing energy, but it would take a combination of stress and physical pain to change the trajectory of his career. A lack of job fulfillment coupled with chronic back pain that hindered his passion for long distance running made him realize that something had to change. Gracey became increasingly frustrated after traditional western medicine options did little to treat his pain. Just when he was contemplating surgery, a friend suggested acupuncture. Within weeks of beginning regular treatment sessions, his pain subsided while he experienced a heightened sense of calm and focus. He was also able to return to his love of running, and went on to complete four marathons. His positive experience with acupuncture inspired him to forge a new career where he helps others live happier, pain-free lives. He studied forms of acupuncture and holistic treatments in both the U.S. and Japan before opening Gracey Holistic Health in 2003. He is more than happy to answer questions, address concerns, and work with each client on a one-on-one basis, creating an individualized treatment plan to help them feel their personal best. Gracey earned his master’s degree in acupuncture at the New England School of Acupuncture (NESA.) He completed a nine-month certification in Toyo Hari Meridian Therapy, a form of Japanese acupuncture, during his education there. He then studied non-insertive Shakuju Therapy (SJT) in the States and Japan. He is a founding member of the Shakuju Association of North America and has taught acupuncture at NESA. Gracey has also authored several acupuncture publications. But acupuncture is just the beginning; Gracey Holistic Health offers many complimentary therapies that enhance acupuncture such as bodywork, cupping, magnetic therapy, essential oils, herbal treatments, and more. Because he understands that nutrition, exercise, and emotional well being all contribute to good health, Gracey offers health and lifestyle coaching to help clients make better lifestyle choices to live a happier life. Gracey Holistic Health operates two locations — Belmont and Brookline — that offer nearby parking and are accessible by public transportation. Begin your own journey towards health and emotional well being today. Schedule your appointment at 617-549-1196.